David M. Serafin has over fourteen (14) years of legal experience. Giving him a unique edge over other Denver lawyers as taxation related issues frequently intertwine with bankruptcy, debt collection and estate planning issues, David has obtained a Master’s Degree in Taxation from the University of Denver, graduating near the top of his class with an ‘A’ grade point average. David especially finds gratifying helping clients who, because of job loss, medical bills, foreclosure/repossession related issues or credit card debt, have been required to file for Chapter 7 or Chapter 13 Bankruptcy. David further enjoys the intellectual stimulation of the tax issues involved in areas such as estate planning and as there are frequently new developments which require keeping up-to-date. 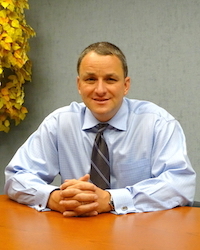 He is able use his unique tax credentials to his clients’ advantage in situations affecting those facing an IRS tax audit or an audit from the Colorado Department of Revenue, particularly as it relates to complete discharge of tax debt or an interest/penalty free payback of such tax debt in Chapter 13 Bankruptcy. When not working, David particularly cherishes his time at home with his wife, two sons and two rambunctious dogs. He also enjoys skiing, tennis, mountain biking, hiking, scuba diving and traveling.